But the way in which Evan hears music is not like the way I hear music. And I am an incredibly sensitive, emotional person. A canary, as Glennon Melton likes to call us. But Evan hears music in his soul. In his heart. Not just with his ears. In fact his ears are probably the last place that hears the music. When he was a young toddler, I noticed that when I would play hymns for him, he would become entranced. The more climactic the song, the better. Sometimes he would squeal for more. Sometimes he would sob at the end. Possibly because it was ending, possibly because the song swelled and his little sensitive heart couldn’t take it.. I’ll never know exactly. Here he is at age 2 watching Carrie Underwood and Vince Gill sing “How Great Thou Art.” You’ll notice the legs kicking, the excited rolling of his arms, and the stare when he realizes the song is almost over. And finally, I played him the same video with Carrie U and Vince Gill today. I had to splice together a few bits and pieces of his listening experience. We had Spotify on the TV so he just had the album cover and title on the screen. I just wish for one minute I could be inside his complex mind and see what he is seeing and feeling. Anyone with children, or daily exposure to young ones- has probably heard those phrases coming from a few different toys. Fisher Price has done this very lovely thing and used the same sing-songy female voice to say “It’s learning time! It’s music time!” when you press certain buttons on their toys. Most distinct examples are the Laugh and Learn Puppy and the schoolhouse frame you see in these pictures. Evan loves this toy. No, he LURVES it. With every ounce of his bouncing, joyful being. Here’s the catch. I do NOT love it. Evan started a cause and effect game with us using this toy. He would open and close the mailbox until he would get the right combination to produce the alphabet song. Then he would glance at us (mommy and daddy) to wait for us to sing the song along with it. We were so tickled that he figured that out and he was connecting with us through this game. This was when he was about 17 months. Notice the abundance of musical, electronic toys. This was before we visited Dr. Mervis and were advised to get rid of all the toys that had on-off switches and incorporate more “old-fashioned” toys. This suggestion was made to encourage Evan to do more engaging play that required him to use his imagination and also communicate with us when he needed help. Herein lies the title of this entry. When Evan encounters this toy, or any toy that is similar in fashion- one that has a switch that turns on music, action, or lights, he becomes entranced and very involved in the toy. It is difficult to get his attention and even more difficult to elicit any communication. My heart literally ached on Christmas afternoon when my dad’s wife (he calls her Mom-Mom) came in the room to greet Evan and he didn’t even look at her. Not a glance. He was busy roaming around the schoolhouse frame and turning on and off those switches he remembered so well. She hugged and kissed him anyway and went back to cooking. Honestly, she did not seem to be bothered by it at all. She was happy to see him and thrilled that he was happy. And there I sat, knot in my stomach, blinded by the diagnosis. Blinded by the lack of engagement that we have been working so darn hard to increase. I didn’t see my happy son who was being pleasant, even-tempered, and occupying himself with a toy he loved. I was seeing the disability, the developmental delays. The very thing I preach about looking past. There are moments, days, weeks, that can go by where I am thrilled by Evan’s progress, excited to discuss Williams Syndrome with friends, touched by the smiles that Evan elicits from strangers. Then there are days like this. When I wake up, filled with hope and expectations of a wonderful day spent with family. And by the end of the day, Evan is in the backseat of the car, scripting away, “It’s learning time!” It’s music time!” and I have to fight back tears. The word defeated feels accurate and awful at the same time. Lately I have been having a more difficult time embracing the joys, embracing the progress that I blogged about so recently. I know it is due to the holidays. Due to the stress I was under at work this past month. Due to the hustle and bustle of non-stop gatherings, entertaining, and changes in schedule that occur for everyone this time of year. I struggled with whether or not to write about it. Because I do strive to see the positive slant on things. I do realize how incredibly blessed we are. But it would be a disservice as a writer (and a deeply sensitive one at that) to ignore the ugly truths that creep into our lives. To not acknowledge that being a parent of a child with special needs is hard. Capital H. Hiz to the ARD. But being honest about it is freeing. Knowing that the Hard is worth it. Knowing that there are plenty of others out there who are also dealing with the Hard. And we don’t have to pretend that it is easy. Thank goodness there is also Joy. With a capital J. So I sit here in quiet. Beautiful, thought-provoking quiet. I used to lament the fact that I never had time in our house by myself anymore. Todd and I have always been good about letting each other have our “me” time, whether that means going to an exercise class, going camping, blogging, out with friends, etc. But just by the way of scheduling and being a mommy- I never got the house to myself. Well wouldn’t you know it, going back to work actually provided me with not one, but two days where that happened. Even if just for a short while. It’s weird, I keep thinking I hear Evan on the monitor that isn’t even turned on. Since I am a teacher in N.J, we still get off for the annual NJEA convention in Atlantic City. This year since there was an election for governor, we also got off on election day. I decided Evan could still go to school, since he loves it so much, and this way I would get more done. So I decided to spend election day working on insurance phone calls and paperwork that had started to pile up. In my crazy little head (actually the Gaynor cranium is not a small one), I had thought it would be a great day. A day that would clear my mind, and get all that insurance stuff off of my shoulders and some more money in our pockets from reimbursements to come. Oh Erin, silly, silly Erin. How quickly you forgot how incredibly frustrating it is to go through menu after menu of automated voices. How infuriating it is to speak to four different people at the same insurance company but only one of them seem to have an idea of what is what. How emotionally exhausting it is to realize how many therapies your child receives and how much it all really adds up to financially. And honestly, we do not have it that bad. I know our situation could be much much worse. But Tuesday afternoon, after about five hours of sitting at a laptop with two different phones and bills strewn around me, I felt myself start to crumble a bit. I popped on the beautiful piano music of Alec Sweazy. Can’t you see Evan in his kind eyes and smile? Of course this tears me up from the inside out too. Some of my worst fears are of Evan being teased and bullied. Thank you Alec. Thank you for sharing your talent and your honest feelings. It scares me, but I know not to be driven by fear. It will get me nowhere. at two and a half years old. So lucky to be his mom. This weekend we took Evan for his hippotherapy evaluation. Yes, that means exactly what you think, he is going to do therapeutic activities on a hippo. Just kidding…..Or maybe you are thinking he is going to be hypnotized, ala hypnotherapy. Neither is correct, but don’t feel bad if you aren’t familiar with the term either. Not sure about this horse stuff, Mama. Of everything we have tried, this was one therapy that I was super excited for, but I also had no clue how it would go, or how effective it would truly be. I knew Evan would enjoy being around horses and spending time with adults and young people at the farm. I also have a love of horses and I have ridden horses several times in my life. But I had a hard time imagining him doing well on a horse, and I wondered how exactly it would help him to progress. When he wasn’t walking- not all that long ago!, both his physical therapist and Dr. Mervis, the researcher we see in Kentucky, suggested that we look into hippotherapy. Dr. M’s exact words were, “Get him on a horse.” She felt it would help strengthen his core., which in turn would help with his language development and walking. 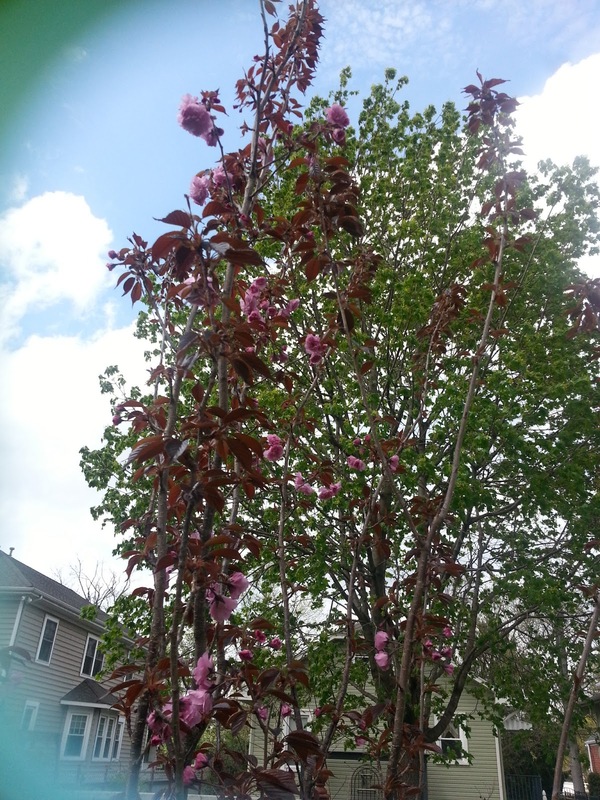 I started looking into it last spring. I found a lot of local places that did recreational horse therapy, but not hippotherapy. Apparently they are similar but it is harder to get insurance coverage with the former because it is not done by a licensed therapist. I called around, asked questions, looked into our insurance and decided it would make sense to wait until the fall when we were back on my insurance, which has better coverage overall. And then as luck would have it, one of my new warrior mama friends (who I practically cyber stalked-a story for another day) suggested this horse farm. She had taken her daughter here for hippotherapy and raved about it. She also was very happy with the support the therapist gave her as far as getting insurance to acknowledge the therapy and get most of it covered. Sounded like a win-win situation to me! So off we went to do a barn tour and then an evaluation was scheduled. We set off to Brandywine Occupational Therapy and the wonderful Miss Lauren. My mother went with me, which was very helpful. The occupational therapist asked a lot of questions and it was nice to have a second pair of hands to keep Evan close by while we were having him climb on the playground equipment and walk around. Her extensive knowledge in the area of occupational therapy is evident and it made me feel very at ease to know Evan was in good, professional, educated hands at this facility. She used technical terminology and offered reasons for things that Evan does, while also giving praise for different things he has recently started to do. It’s always heartening to know your child’s therapist really knows her stuff. And Evan’s really do. At first, I was worried Evan was not going to dig the horse experience. He started this low whine when they put his helmet on, and he kept looking around like he wanted to anywhere else but at this farm. Then they had him use a mounting block (bc she thought he could handle it-which thrilled me) and got him up on the horse. He kept doing this low whine and squinting his eyes, like he does when he doesn’t like the food you offer him. My heart sank, because I really had such high hopes for him. (which translates to high hopes for me- I need to work on that) Luckily, as often happens with Evan, the waiting and anticipation of the activity can sometimes cause him to whine and get impatient. But once they started to move, and the horse began to ebb and flow beneath him, it all changed. After a few short moments he started to say, “Whee!” and “Neighhhhh.” His whole demeanor changed. He held on tightly and kept his back erect the whole time, not waivering at all. I thought for sure he would try to get off, or lean side to side but I was very wrong. The therapist started to try different things, like going diagonally across the ring, doing figure eights, and stopping and starting. When she would stop, she would ask Evan to tell the horse to “walk.” He just kept saying, “Neighhh!” Then she suggested saying, “Go, Vixie!” (the name of the horse) After two times modeling for him, he did it independently when she stopped! I was floored. We are working hard on two word combinations, but I never thought he would do one so quickly, and with a new therapist, on a horse!!! But looking back, that is probably precisely why he did respond so quickly. No need for bells and whistles when you have horses! (thanks Aimee for that realization) He probably spent about 15-20 minutes straight on the horse with no signs of fatiguing. He was especially fond of saying, “Hi! How are you!” to the young lady who was helping on the other side of the horse. He didn’t tire of looking at he and batting his big blue eyes at her and smiling before shouting, “Neigh! !” all over again. 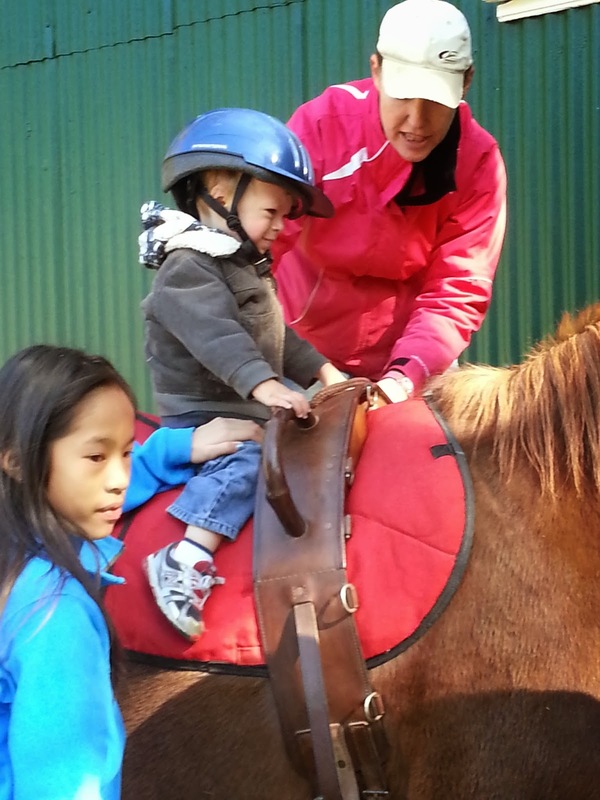 The natural feeling of riding a horse is so significant for a child like Evan who seeks sensory input all the time. He loves movement, bouncing, being upside down, rocking, etc. And a horse provides all of that in a controlled, organized way. So the biggest deal of the whole experience was when he had to get off the horse. She said “Ok, Evan, we’re all done now, we have to get off the horse.” He responded by gripping as hard as he could onto the handles and sticking his bottom lip out as far as he could. She pulled him off, handed him to me and he went in to full blown teary meltdown. He wanted to get back on her so badly. I can’t really put into words how this hit me emotionally. I can say I definitely welled up with tears. Not so much because I was sad for Evan, but more because I was so excited at how much he connected with the horse, and how he truly was sad he had to get off. Evan has such an easy going temperament. He does not throw a fit when I drop him off at school, in fact, he will walk up to almost anyone, saying “Hi!” and he does not seem to lament the fact that his mommy or daddy are leaving him. (believe me I know how enviable that is) But that also means he does not display other typical behaviors, like an affinity for things that mean something to him. So to see him feel true sadness because of how much he LOVED being on that horse, it just filled me up inside. I can’t wait to take him again. And to see how she is going to work on self feeding goals on a horse. Somehow, I trust it will work. The best part of my day is……. I wasn’t planning to blog today. I am shooting to get one blog entry done a week, if I can manage that, and I already filled that quota. However, I had a few emotional few days this week and then today was a darn good day. An all around, decent, worth remembering, GOOD day. And those days need to be blogged about. Like that preposition at the end? Good, because there will probably be plenty more, I have a tough time avoiding them. Typically, the best part of my day is the last ten minutes or so before I put Evan in his crib for the night. We sit in his nursery almost every night, feed the fish, sing songs, and cuddle. We sit in the dark, whispering, singing, and wrangling. Wrangling is what I do when he wiggles all over the place trying to get out of my arms. I wrap him up in his doggie weighted blanket and some nights he actually leans on my shoulder and allows me to hug him and really hold him. I can remember when he was teeny tiny and I could do that whenever I wanted to. However, because of many different circumstances- MAJOR sleep deprivation being the main one- I didn’t enjoy it like I wish I could have. But I sure do now. And today was a day where I feel like I had moments like that over and over. I started out the day heavy lidded, as I listened to Evan bounce and sing in his crib at 7:15. I typically would have been thrilled he slept that long but I had a tough night’s sleep so I was pretty out of it. But then he ate a great breakfast, almost an entire waffle with jelly and cream cheese, and we set out in stroller and on foot to the local park to meet E’s speech therapist for a session at the playground. On the way, she wrote me to say she was running a little late. So I walked a longer route, and took Evan out of the stroller along the way to let him walk. He toddled all over, through piles of leaves, sidewalk, grass, transitioning from surface to surface with no problem. I was amazed. Each person who passed by jogging or walking a dog was greeted with a very upbeat “Hi!” and a huge toothy smile from Evan. He independently pointed to and identified flowers and a dog. I just couldn’t stop smiling. Then on the playground equipment, we had a ball. During the speech session, we worked on two word combinations, waiting for him to say, “Push, Mommy” when on the swing. And then generalizing to, “Push, Becky.” to his therapist. Not only did he do that after only a few examples of modeling- we are pretty sure he tried to say, “Push me, mommy!” Which is MASSIVELY HUGE. I don’t know that he has said three words together on his own, except for book text or songs. One of the most exciting moments was when he went down the twisty slide totally on his own- so much on his own, that I didn’t even know he went down until he was at the bottom, face down because he went down on his belly. A few months ago he wouldn’t have gone down even with assistance. He did get a mouthful of mulch once, but he bounced right back. I love his resilience. Becky worked on adjectives in two word combos- “Green leaf, yellow leaf, bumpy slide, etc.” All the leaves she used were on the ground. On the way home I stopped a few times and pointed up to trees that were within reach and without receiving an cue- he said “green leaf.” Of course he did that for red leaves too, but it was two words, and he knew they were leaves! I just kept beaming. One thing I have been working on with Evan for months and months is getting him to use please and thank you. Becky has said it is not necessary for me to worry about him using them with any type of consistency- that we should focus on other things first. But I still keep trying. I had just mentioned to her that Evan still isn’t saying please. Well, we got home, and I got out a bag of veggie sticks (the ones that are glorified potato chips in stick form with a little veggie dust. I held one out to him and he said, “stick please” (his approximation sounds a little more like “ick, pee.”). I squealed with happiness and he definitely got his ick. Moment after moment of progress and joy. He also ate a dinner that consisted entirely of solid foods. No jars. Fish sticks and tater tots. Gourmet and fancy it was not. But age appropriate it was. Our tough little guy who used to balk at eating anything that wasn’t watery and on a spoon. My favorite part of today was the whole kit and kaboodle. I was able to take a nap with Todd while Evan napped. Evan ate like a toddler. I finally bought new shampoo this week so I was able to clean my hair today without squeezing the heck out of an practically empty bottle. Evan sang along with me while I sang some showtunes. Thursday night I found myself teary eyed while talking to some friends about how I was worried I was “missing it.” Worried I was missing the good moments with Evan, that life was passing by too quickly now that I was back to work. Not entirely anyway. Today was a good day. Darn good. And that is all that matters right now. W is for walking- w-w-walking….T is for toddler. T-t….typical…? If you would like to sing along with this entry’s title, please watch this. I probably sing a version of that song about 20 times a day. No, I am not exaggerating. Music is the cure for everything when it comes to Evan. So since posting the walking video at the park last week– we took a vacation to Vermont and are now home safe. I expected that Evan would be toddling all over Stowe. Alas, he continued to prefer crawling and even with prompting, did not do much independent walking. Our awesome physical therapist takes us to the Children’s Discovery Museum in Cherry Hill occasionally and she works with Evan using the exhibits and equipment. Clearly, it is highly motivating for him as you can see in the video. Since Monday when he took off walking all over the museum, he has been attempting it more and more. He needs a reminder now and then to stand up, because I think he is just so used to immediately dropping down to crawl that he forgets. It is so exciting to see him taking risk after risk and trying so hard to stay upright as long as he can. Then today rolls around and he eats almost two whole pieces of french toast, I started having him use a step stool to wash his hands, and he helped me “clean up” some of his toys. Big boy! He also has begun testing limits big time. He has known the meaning of the word “no” for quite some time. He doesn’t always listen to it, but he does take a moment to process it and it gives me a second to intervene. Today he started to do things he knows he is not supposed to, for example, pulling my earring out, or grabbing remote controls. He starts to do the forbidden activity and then looks over at me and says “ohh? ohhh?” Basically prompting me to say no. So I do, and then he tries again. Tonight this happened approximately five times in a row. After he skipped his nap. Suffice it to say, I was pretty frustrated. I tried to be “Super Nanny” and repeatedly remove him from the situation, and be as calm as I could be. It took a lot of deep breaths. It was one of those nights where I was counting down the moments until E’s bedtime so I could have some time to myself. Then I started our bedtime routine. I wrapped him like a burrito in his weighted blanket, we fed the fish, and sat down to sing some songs in the nursery rocker. He has been really into “You are my Sunshine,” lately so I started singing that. He cozied up in my lap, leaned his head against my chest and looked up at me with those sparkly eyes. It was very apparent that he was content. Content to simply be in my lap, listening to a song he loves. I know he was displaying typical toddler behavior when he was seeking to hear “no” over and over. I was actually kind of thrilled. That is one of the funny parts of being a mama to a child with special needs. You rejoice when they throw “typical” tantrums. You rejoice when they eat french toast without gagging. Almost two WHOLE pieces of toast! But the way I felt holding him in the rocker tonight, that wasn’t unique to special needs mamas. That was just good old fashioned mama love. Hopefully you sang along to the post title to the tune of this song. When I sing that with him, he gets so excited that he fills in the word me before I even get to it. So adorable and so Evan. Sooooooooo…..the big news is, Mr. Man took more than just two wobbly steps this week. He walked across the living room during a physical therapy session. AND, the following day in music class he toddled all over the place, walking from person to person. He is not a “walker” yet, he still falls or sits down in between little bursts but this is huge for him. We just got back from seeing Dr. Mervis, the research geneticist down in Kentucky, and she and another highly regarded geneticist Dr. Morris both felt that Evan would benefit from shoe inserts to help his balance and pronation. So the minute we got home, he measured him and ordered them and they arrived yesterday. So you are probably thinking, wow, that is great, you put the inserts in and they helped him right away! Funny thing is, we hadn’t even tried them yet. 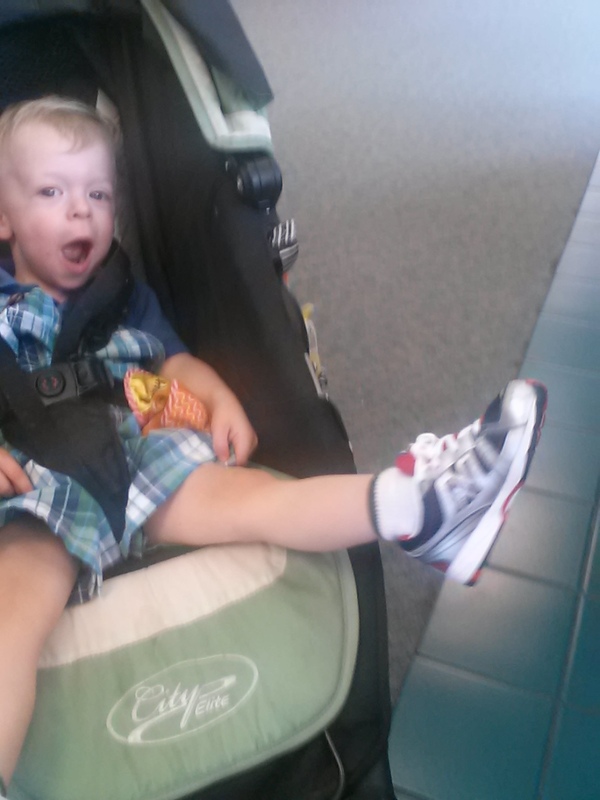 I just took him today to get new sneakers bc his old ones were far too small to accommodate the orthotics. Excuse the fuzzy phone picture below, but there he is showing off his new kicks. Now Mommy and Evan can wear New Balance shoes. His are FAR cooler than mine. (and that is not a joke-my sneakers often resemble those of individuals far older than me because of my elderly ankles and feet) The best part is that they fit the orthotics great, and they were cheaper than the Stride Rite pair he was wearing. The most amazing part of all of this, is the feedback I received from his little video. I, of course, rushed to the phone after PT was over and called Todd to tell him the good news and I sent him the video. Then I sent it to all the grandparents and close family members. I posted it on the Williams Syndrome Support group and sent it to a bunch of friends. The responses I received were so heartwarming and touching. Lots of “Yays!” and “I’m so proud of him, and of you!” and my favorite, “Happy tears!” I started tearing up several times just reading the responses. It just reminded me of how precious this little guy is. He is so loved and cared for, and that is really all a parent wants for their child, right? That he would be loved and cared for by the people in his life. And Evan has that a million times over. I’ll keep saying it, thank you so much. We are some lucky folks. The month after we lost my dad, Learning Stages put on a fundraising event that celebrated the 20th anniversary of the organization. For those of you who do not know, Learning Stages is a non profit theater group that I have been a part of since I was 14. I performed in the chorus mostly, then started helping out with the production side of things, while also acting in one act plays. Finally I taught and directed the childrens’ theater program for 8 years before taking a break to have Evan. I am extremely proud to be associated with this group, I have developed many of my closest relationships through the program and it has helped feed that hunger I have always had for creating art and working with children. I had been looking forward to the 20th anniversary show for months and months. I knew it would be like a mini reunion with those I had acted with many years before. I also was looking forward to performing again. It had been a long time since I participated in musical theater as a performer. When I told my dad that we were going to be showcasing many of the numbers we had done throughout the years, in addition to other songs- he made a single request. He asked that Joe Salvatore (who he had always called Joey) sing “Oh What a Beautiful Morning” from Oklahoma as he had the first year I was a part of the organization in 1993. When I brought it up to Joe, he said he had to think about it. Joe is now an NYU professor, director, playwright, speaker, the list goes on. He has come a LONG way since donning the chaps and cowboy hat he wore as Curly in 1992. After my father passed, he made the decision to honor my dad’s request and he did sing it, entering the stage quietly with no music, beginning the song a cappella as he did so many years prior. I stood backstage in the wings biting back tears. I just knew my dad would have given Joey his own personal standing ovation if he could have. He just adored him and he was so thankful that I had joined the group as well. That moment meant the world to me then and it still does. 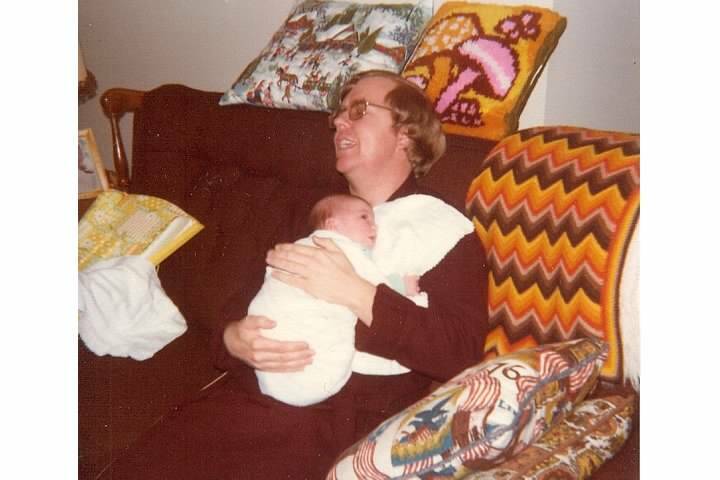 I was very lucky to have a dad who wasn’t afraid to express how he felt about others. I think I have adopted that same fearlessness with most of the people I care about, but I know i could take even more risks in my relationships. I think we could all learn from him in that department. I find myself delighting in some things I would have not have found so delightful a few short years ago. Now, they light up my day. -The disappearing of a whole sandwich- Evan ate about 95% of a PBJ today! -Turning on the box AC units again, even if just for the fan, because the sound is fantastic white noise for good sleeping. – Sleeping longer than 5 hours.